My family fights a lot. Ok, I should probably qualify that statement! We’re ok, I’m not about to announce a separation or some other kind of family trouble. But a normal way that our family operates is by fighting, some might call it “play-fighting.” And that phrase might work, as long as your idea of play-fighting means that we occasionally, inadvertently, make each other cry, or leave bruises. Ok, this is not helping. I’m just making things worse! Let me give you an analogy. 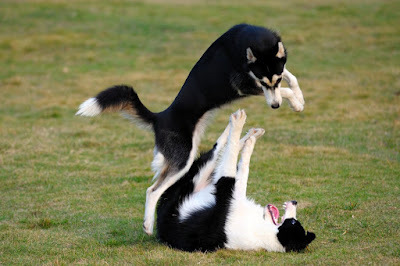 Have you ever seen dogs play? If you’re not a dog person, the first time you see dogs play, you might mistake it for a dogfight. They play hard. And sometimes they get a little carried away and leave crying and maybe even bruised. But that’s just the way they play. They will often play until someone submits, until one of them is on their back with the other’s teeth around their throat. And then they both get up and walk away like nothing happened. And then we had to explain how our family works. Although, I’m not sure our explanation made her feel any better! We play hard. But we do just about everything that way together. We don’t just play hard, we laugh hard, we cry hard, you get the picture. And this has me thinking, especially as my girls get older, I wonder if they’re going to have to give their significant other a warning, a disclaimer, before they bring them into our family? I can just hear them now, this is how I imagine their conversation going in the car on their way to Thanksgiving dinner, “So, I should probably tell you a few things about my family before you meet them.” “What, are they racist?” “No, nothing like that. We may look like we’re fighting but we’re not. We might seem rude to each other but we’re not. We might seem like we don’t like each other but we do.” “So, how will I know if you’re really arguing? Like when someone cries?” “No, we might do that.” “So, like if it gets physical!” “No, we might do that too.” “Well, then how will I know if it’s serious? An ambulance?” “Yes, definitely if an ambulance is called, than you’ll know we’re not playing anymore…I think.” “I think I’d rather them be racist!” Oh, God be with anyone who wants to join our family! Now, your family may not be quite like mine but I think you can relate to the family disclaimers. When you welcome people into your family, whether it’s permanently or just for a dinner, sometimes you have to warn people about certain things, or certain people. Sometimes you have to warn people about racist uncle Bob, or overprotective mom, or judgmental dad, or critical grandma. Every family is quirky, every family is weird, every family needs a disclaimer or two or more. And your church family is no different! I think the first session of the Journey of Faith, that’s what we call our process for joining this church, the first session should include a disclaimer. That way everyone knows right out of the gate, what they are getting themselves into! I think sometimes people have an idealized expectation of what church life might be like, of what church people might be like. As amazing as we might be, and I do think we are pretty amazing people, we are also human like everyone else. We fight and bicker like anyone else. We joke and tease each other like anyone else. We make each other laugh, we make each other cry, and make each other want to pull our hair out like nobody’s business. We can be endearing, and also very annoying to each other. The truth is, if people come to church expecting to find these superhuman people who never get angry, who never let our egos get in the way, who always do the right thing, boy, are they in for a rude awakening! However, in spite of all that, at the end of the day, we all want the best for each other right? In spite of how much we might drive each other crazy, when one of us hurts, we all hurt, when one of us is in need, we are all in need, when one of us is attacked, we are all attacked—because that’s also, how family works. We ease each other’s pains, we fill each other’s needs, we defend and have each other’s backs. In our reading from Mark, Jesus is redefining family for us. And it’s important to note that this is only in chapter 3 of this Gospel. This is at the very beginning of Jesus’ ministry. He has barely taught them anything at this point. Only healed a handful of people. And so his redefining of family at this point in the story, is as if he is saying, none of what you are about to experience is going to make any sense, unless you have a wider understanding of what family is. And for us, two thousand years later, it might sound more like, nothing you are about to read in this gospel, is going to make any sense, unless you can begin to have a wider understanding of what family is. Family is not about your family tree, it is something deeper than that, it is something harder than that. Anyone can make a family tree, all you gotta do is starting connecting the dots between your dad’s dad, and his dad, and his dad, and your mom’s mom, and her mom, and her mom, throw in all the children, and boom, you got your family tree. Easy, especially because you don’t have to choose whose dad is whose, or whose mom is whose, or whose children are whose. You just fill in the blanks. What’s not so easy, is looking at total strangers, which you all were at one time, and seeing family. Especially when, you don’t have to! You get to choose whether you want us as family or not! When you don’t get your way, or when the council makes a decision you don’t agree with, or when so and so pisses you off, or when your pastor uses the word “pisses” from the pulpit, twice no less—we can choose to leave any time we want to! People walk out on their families all the time—and for much lesser evils than I’ve mentioned. But that’s easy! Which is why Jesus gives this disclaimer so early in his ministry! Jesus knows it’s hard work! If anyone knows that, it’s Jesus. But none of his teachings are going to make sense, unless we can reimagine how we see family. And Jesus knows this takes practice! Jesus knows this isn’t going to happen overnight! Which is why we come here, week in and week out, to practice this with each other! So that, you think that’s hard, so that, we can practice this out there! Granted, we’ve been practicing this for two thousand years now, it’s bound to catch on! But the whole point of practicing this reimagining of family in here, is so we can practice it out there. Just as we here were once strangers and are now family, so too, we are strangers out there, and can be family. With a few disclaimers of course. Because that’s how family works. Thanks be to God. Amen.